Only 2-minute walk from Tienanmen Square, This hostel is located in the heart of a hutong protected area. The hostels building dates back from 1875. 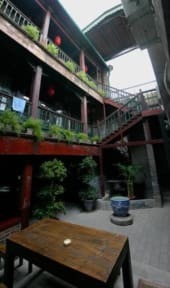 Consisting of three two-storey buildings with inner courtyards, Qianmen hostel with its wood-carved balconies is a beautiful example of Chinese traditional architecture. The building has been transformed into a hostel offering more than 40 comfortable rooms to travelers looking not only for budget accommodation, but also a unique experience during their stay in the China's capital. You couldn't ask for a more convenient location. 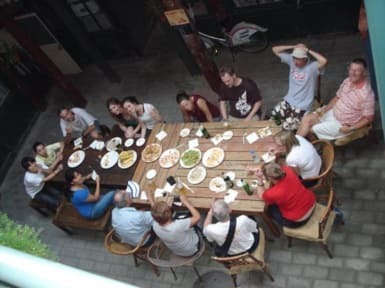 Qiamen Hostel is located just a few minutes walk from Tienanmen Square and many important historical sights: the Forbidden City, Chairman Mao Mausoleum, the Great Hall of the People,Dashilar walking street which is 600 years old, liulichang Art and culture street, and Beihai Park. -Room equipped with old style furniture. For those who wish to enjoy traditional Chinese entertainment, Beijing opera, acrobatics, Kung Fu tickets can be booked at the reception. The hostel also offers many tours, including excursions to various sections of the Great Wall, a must-see during your stay in Beijing! -Take Airport shuttle bus to Xidan (last stop of theXidan line) cost 16 RMB, then take a taxi approx. 10minutes cost 15 RMB. Train: If you arrive at the Beijing Central station (Beijing Zhan) take the subway, two stops to the Qianmen Subway stop.To go out from exit#c to meishijie. Metro ticket 2 RMB. If you arrive at Beijing West Train Station (Beijing Xi Zhan), take bus No.9 and stop at Qianmen xi.Then turn to left 200 meters away to meishijie. Walk South on Meishijie. Our hostel is No.33. Taxi: a taxi from the airport directly to the Hostel costs 100 RMB approx. All guests must observe the rules and regulations of our hostel. The hostel office is open for check-in 24 hours a day. Check-out time is 12pm on the day of departure (late check-out can also be arranged). Great location, very cute hostel. Only downside is that the walls are so thin that you can hear everything -- the room next door, the staff moving about in the morning, etc. The hostel is located in a good location, close to Forbidden City , T Square, shopping, and parks. We enjoyed visiting with Kane and his cook. Our biggest concern was the very hard mattress, more like a box spring, very uncomfortable. Also, the bathroom could have been cleaner. I sanitized the toilet before using it and the tile in the bathroom looked like it had not been cleaned in quite some time. While we had one window, we could not get any sunlight because it looked out to a wall. Quite noisy all night then little children of hostel staff running around in the courtyard every morning from 5am. Don't take card payments. Warning: please don’t stay here! The 7 star rating it has is way too high. It’s cheap for a reason! - extremely run down hostel - filthy bathrooms which you have to cross the outdoor courtyard to get to - rude and unhelpful staff - woken up at 2.30am by people shouting outside our room - no lockers/wardrobe - no other tourists, only what seemed to be family or Chinese businessmen Good points: WiFi, good location, booked tour for Great Wall through them We moved hostels after 3 nights. Or room did not lock, the beds were incredibly hard, the check in process was lengthy and inefficient, the staff were rude and unhelpful, the toilets were far away and unclean, you could hear people walking about throughout the night, the room was stone cold. Room was located beside common area which was very loud late at night and early morning due to staff talking loudly. Our door was opened from outside early one morning which made my girlfriend feel unsafe. Staff appeared too busy chatting to each other to help us. Making breakfast seemed like a chore for the staff. WiFi was poor and when we asked about it, we were told it was “free” and not the staffs problem. Only highlight was the organized tour of the Great Wall by an external tour company.